Looking for something new to do with snow? We had more snow when we woke up yesterday morning. So much snow, in fact, that Brent’s test was canceled and postponed two days! It actually wasn’t that much snow if your from, say, Utah like we are, but it IS a lot of snow for Tennessee. Especially since it’s snowed so many times recently. Maybe we brought it with us. Hmmm…. So, I sent the girls outside to play while Brent shoveled the driveway. They were excited to get dressed up but then hesitated at the last moment. I was in no frame of mind to bundle up and play in the snow so my mom graciously stepped up to the challenge. But they were only outside a few minutes. The next thing I know they are back inside with a bucket of snow cookies. Then they decided to paint them for decorations. I diluted the poster paint down with a lot of water and doled out brushes, bowls and snow cookies. And the girls got to painting. Aren’t they darling. You can tell they were still a little cold from being outside. After the cookies, they wanted more snow so my mom filled the bucket with snow from outside and the girls got to form it into different shapes. I love the eyeballs. This was a great activity for me because we were able to enjoy the snow without spending time in the freezing cold. What have you done to enjoy the snow? I’ll admit it; I don’t like winter very much. I could happily hibernate for much of the season, but my February-born little girl is finally embracing her birth month and has been having a lot of fun in the snow this year. So, I’m trying to give us some more active time outdoors. Here are my tips on making winter more enjoyable for those of us who aren’t snow bunnies! My first tip for winter activities is: Dress warmly! I don’t just mean the kids, I mean the adults too; because if you’re cold, you’re going to get cranky. That means sweaters, jackets, hats, scarves, gloves/mittens, warm socks, boots, and legwarmers, long johns or snowpants. Buy good winter gear that is appropriate for your location. Where I live, we can have cold snaps where the temperature goes down to minus 30 or 40 degrees Celsius with the wind chill factor (that’s minus 22 to minus 40 degrees Fahrenheit), so warm winter gear is a must. I’ve had a good ski jacket for several years, and this winter I bought myself a pair of Columbia boots which have made a big difference to my outdoor enjoyment. My second tip is: Be prepared! If you’re driving to your destination, throw extra mittens, hats and scarves in the car. It’s never a bad idea to have a change of clothes in the car, whatever the season – just in case! Bring a lightweight sled to tow toddlers, and shovels and buckets for digging in the snow. Bring snacks, or plan to make a stop for snacks (my gal loves hot chocolate after winter fun). And always put tissues in your pockets to wipe cold, runny noses! If you’re walking, fill your pockets or consider carrying a tote bag or small backpack. Third: Try to see winter through your child’s eyes. Although I might complain about the cold, I love seeing my daughter run, laugh and giggle as she plays in the snow. She loves to skate (on her bobskates), ski (with her toddler skis), go sliding/tobogganing and just generally muck around in the snow. She has so much fun that it makes me have fun too! Fourth: Accept invitations! Many of our fun winter times have been when we’ve joined friends, either simply for a walk, or a planned activity. Sliding/tobogganing is so much more fun with a group, and a winter hike and picnic with friends gives kids a glimpse into what nature looks like during this season (just remember to wear snowpants or bring a waterproof picnic blanket). 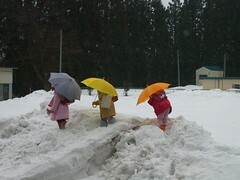 Try silly games when you’re with friends: building forts, having a snowball fight, or mix it up and play snow Frisbee! So that’s a bit of my advice. They’re all simple tips, but following them has made our winter more enjoyable this year. Have fun! Which of Skylar’s tips will help you and your little ones enjoy the winter weather the most? One of our favorite winter activities has been curling up on the couch with a blanket and a stack of books to read. Sammi has definitely moved into longer picture books. I’ve been surprised at how long Elli also sits still on my lap and listens as I read these long books. We received a few more books from Scholastic in the fall to review. Sammi’s instant favorite was from the series Adventures with Riley and is called the Polar Bear Puzzle. The first time we looked at it I thought it was going to be a flop. It’s a fictional story with nonfiction facts dotting the pages and running through the storyline. I didn’t think Sammi would like the length of the story. Boy was I wrong on all counts! She loved learning about polar bears. She loved the storyline and the mixed media illustrations. After we read the book, she poured over each page remembering what information went with each picture. If she couldn’t exactly remember, she’d have me read it again, but then she went back to exploring the book on her own. She has carried that book around the house, to the store and even to bed on occasion for the last few months. I really am surprised that she picked such a sophisticated book to love. That’s a credit to the book, I think. It took a difficult concept—global warming and its effects on the polar bear population—and made it come to life for Sammi. It’s been great to reinforce the winter season by talking about animals that depend on the cold weather as part of their life cycle. Another book we received from Scholastic that has been a lot of fun for the girls is Marsupials by Nic Bishop . The photographs in this book are such a treat. There’s a lot of information on each marsupial. Honestly we haven’t read every word of every page, but one main sentence is larger and contrasted from the rest of the page. It serves to give us the main feel for the animal and then we also read the caption for the picture. I love that Sammi and Elli, too, both love looking at this nonfiction book. It’s a great introduction to using books to find facts because it makes the information accessible in a brief sentence without losing the depth of what older readers would want to find as well. This post is part of Winter Wonderland. If you haven’t already, please enter to win one of the great prizes from our sponsors. Just leave a comment on Join the Winter Wonderland. For an additional entry, you can leave a comment on this post, too. What books has your little one loved that surprised you? The holidays are over and it’s still winter! Now that the novelty of snow and cold weather has worn off, what are we going to do to survive the next few months of winter? Why, celebrate, of course! I came up with the idea for Winter Wonderland from a Care Bears book I bought Sammi at the grocery store. The last story in the book is Winter Wonderland where all the Care Bears get together to celebrate the first snow. We’ve already had our first snow, and second and third and a few while we were away for the holidays, but we can still celebrate the joys of this season with the enthusiasm of those Care Bears. They had singing, games and treats; my definition of a pretty exciting party! It wouldn’t be a party, though, if there weren’t great prizes up for grabs! We have some wonderful sponsors who’ve donated products for BBGU readers to win as part of Winter Wonderland. Leave a comment on this post describing your ideal winter weather. Become a fan of Because Babies Grow Up on Facebook! Add the Winter Wonderland button to your sidebar, if you have a blog. Add Because Babies Grow Up to your blog roll, if you have a blog. An additional entry for each post on BBGU you comment on during the Winter Wonderland Carnival. Winter Wonderland is open from January 18 through January 31 at 11:59 pm EST. All comments submitted before then will count as entries in the giveaways. What is your ideal winter weather?